I hadn’t heard very many good things about this movie going into it, so my expectations weren’t very high. I think that worked out to my advantage, because I ended up liking the movie. It was a bit over-the-top at times, and really long, but for the most part it’s just a good story. Everyone in the movie was fantastic, and there were a lot of parts that really made me laugh. But this isn’t a funny movie. It’s actually pretty sad. My biggest complaint is that Randy (Aziz Ansari) was a tiny character. I’ve watched all of the Randy documentary stuff on FunnyorDie, and he’s hilarious. He is supposed to represent all that is wrong with comedy today, and that makes it super funny. He was only in two scenes in this movie, and neither were funny. So, that was a letdown. Otherwise, the movie was good and worth checking out if you aren’t easily offended and like stand-up comedy enough to want to know what it may be like in their real lives. Definitely better than expected. This movie was good, but a bit misleading. The trailer makes it out to be mostly a comedy. I’d disagree with that. There were some humorous parts, but mostly at the expense of the main character, who at times I just felt sorry for, and at other times just made me angry. Stylistically, the movie is great; the titles, the clothing and hair, the music. Matt Damon did a superb job of playing whistle-blower Mark Whitacre. My favorite parts of the movie were the “narrations” of what was going on in Mark’s head, while much more important things were going on around him. Although the movie wasn’t really all that long, it sure did seem long, which isn’t really a good quality in a movie. I was never bored, but I did catch myself wondering a few times how close we were to the end. Story-wise, though, this movie is pretty great/crazy. I really can’t believe it’s a true story. But it is. And that is crazy. Worth renting. Street Art: Inflatable Bag Monsters. This was a very unique movie. And I really liked it. In a strange sort of way, it reminded me of High Fidelity. I really liked the nonlinear style. I also liked the different things they played with, like at times showing us what was going on in Tom’s (main character) head, or what he expected to happen right next to what actually happens. That will make more sense when you watch the movie. 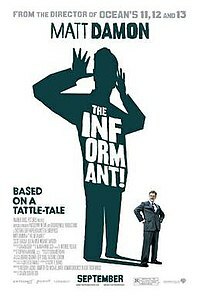 Anywho… this is a movie you should see if you get the chance. Great! This movie has a lot of similarities to Almost Famous (which is one of my favorites), but instead of rock ‘n roll journalism, it’s about rock ‘n roll deejays, and coincidentally co-stars Philip Seymour Hoffman, who is awesome as usual. Actually, the entire cast is amazing. There are some very funny moments, some sad moments, some intense and thrilling moments, and, of course, great music. This movie has what is possibly the greatest soundtrack of all-time. 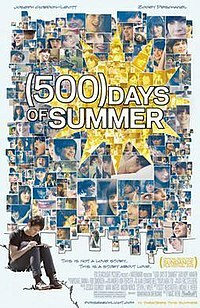 It’s quite a long movie, but it’s good the whole way through. Definitely recommended. My top ten list for 2009 keeps getting harder and harder. Loved it. I have always been, and will always be a Brad Pitt fan, and he definitely didn’t disappoint. His character was hilarious and awesome. The biggest surprise, though, was Christoph Waltz as Col. Hans Landa (The Jew Hunter). He was completely amazing. Definitely one of my new favorite bad guys. I don’t even know how to describe it, he was just perfect for the role. Dude should win an Oscar. 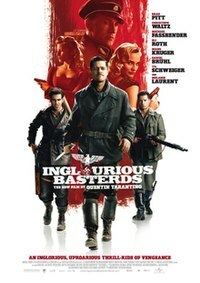 I learned while doing a little reading that this isn’t actually a remake of the 1978 movie The Inglorious Bastards, but that movie was somewhat of an inspiration. I was actually looking forward to watching the older version to see what had been changed/updated, but now that’s kind of pointless. I’m sure I’ll watch it someday anyway. Also, there is really no good reason for the wrong spelling of the words in the title (I like to think it’s the way Brad Pitt’s character would’ve spelled it). Just FYI, the movie was super gory, and it was kind of slow in parts, but not in a bad way. I really liked everything about this movie. Good, good stuff.